Every so often I am asked how I started in photography. The short answer is an unlikely trinity: Dad, “Uncle Walt” and Father Marcel – in that order. Growing up in Parkville and Perry Hall, I attended St. Ursula Church through fifth grade, and graduated from St. Joseph School, Fullerton, in 1978. Family evenings were spent watching the “Wonderful World of Color” hosted by Walt Disney, also known as “Uncle Walt.” Commercial breaks featured his theme parks. Shortly after graduation, my parents announced a big family vacation to Walt Disney World. Dad purchased a new, fully manual, Pentax K1000 35mm camera, and 25-rolls of Kodachrome slide film. Frame-after-frame, my father captured memories of my mother, brother, sister and me enjoying the “Happiest Place on Earth.” Or so we thought. One-by-one, slides were dropped into a small viewer showing an endless string of darkness. Vacation memories would appear on occasion. Only a handful of images from the two-dozen rolls of film Dad shot were good. Mom was not happy. Dad was disappointed and frustrated. I don’t think he read the camera’s operating manual. 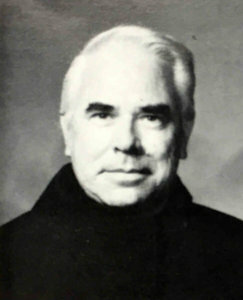 Conventual Franciscan Father Marcel Sokalski is seen in an Archbishop Curley High School faculty photo. My father’s Pentax was quietly confiscated by yours truly shortly thereafter. Photos were taken at every opportunity provided my parents bought film. As an Archbishop Curley High School freshman, I met Conventual Franciscan Father Marcel Sokalski, the American literature teacher, school photographer, and advisor for the photography and journalism clubs. He also published the Curley Chronicle student newspaper, my introduction to publications. 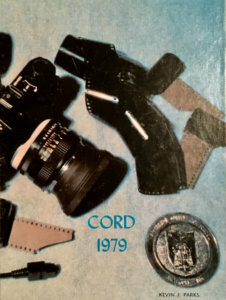 I was also a member of the Cord yearbook staff directed by Conventual Franciscan Father Mark Szanyi. The white-haired Father Marcel was a patient soul who shared his passion, time and talents with his students. Countless hours were spent staging photos in Father Marcel’s classroom, or shooting for the Curley Chronicle or Cord. Darkroom chemistry became part of my DNA. Curley’s WFRS-CCTV station added a dimension to my hobby long before the term “visual-journalist” became commonplace. Dad would detour through Curley’s parking lot many afternoons following long shifts at General Motors on Broening Highway so I could work on my craft. My parents became the unknowing victims of a takeover when I converted the basement bathroom into a darkroom. A metal folding table filled the tight space where Dad cleaned up after work. A dish tub, complete with hoses connected to the utility sink for running water, sat atop our laundry machine for washing prints. My father didn’t mind as long everything was orderly. Mom’s laundry schedule was altered on many occasions. Dad eventually slid his basement workbench a few feet to make room for a dedicated darkroom. Running water denied, I was thrilled. The casualty of a corporate merger between two commercial real estate firms one year into my photography profession, fellow Curley grad, Gary Michael, hired me for his marketing team at Mercy Medical Center in Baltimore. He was my boss for 26-years. More so, he’s a dear friend and Curley brother. This story comes full-circle when I joined the Catholic Review 18-months ago as its visual journalist. Located in the Catholic Center on the corner of Cathedral and Mulberry Streets – it is the original site where my father’s beloved Christian Brothers taught him at Calvert Hall College High School. Dad hoped I would have followed in his Cardinal footsteps. It was more important to my parents I receive a Catholic education. Now gone to the next life, my parents’ earthly remains rest at St. Joseph Church Cemetery in Fullerton. He lives in the Friary at St. Francis High School in Athol, New York, not far from Lake Erie. Not only will the Franciscan celebrate his 85th birthday next month, he’s observing his 66th anniversary of religious life this year. 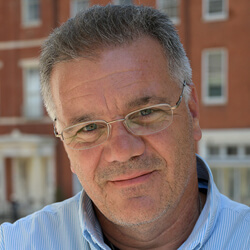 Though officially retired, Father Marcel can be heard during the Father Justin Rosary Hour, which according to their website, is the oldest Catholic radio program in Polish. I had the recent privilege to speak with Father Marcel by phone for the first time in more than three decades. One of the first questions he asked was what camera I was using. 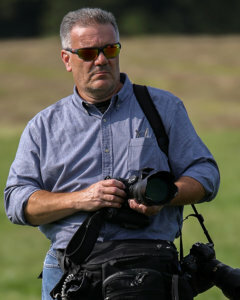 He told me he still enjoys shooting nature, especially the colors of the fall season, using a Nikon D40. “It’s good to know we’re in the same camera family,” I responded. The Curley Chronicle is still in production featuring color images, and is available on the school website. The darkroom where I spent so much time is now faculty and administrative space. Curley’s Class of 1982 will celebrate its 35th reunion this November. A milestone that begs the question: Where has the time gone? Good luck to all for a successful 2017-2018 school year!